That summer everything happened for the first time. The 17-year-old narrator spends his summer days in a metal shop, following the activities and talk of burly men. The bustle is at times chaotic but the opinions are firm. To make it in this group, the assistant must get the hang of the metal workers’ tragicomic code of honour. Uncertainty about the future colours the summer, but the evenings and nights are filled with legal and illegal undertakings. Delicate, difficult first steps must be taken in the realms of both love and sexuality. When the narrator father has to go to the hospital, a message arrives that opens old secrets, and many things appear in a new light. Men and People is an absorbing novel about the summer when a young man acquires his first experience with working life, women and alcohol. 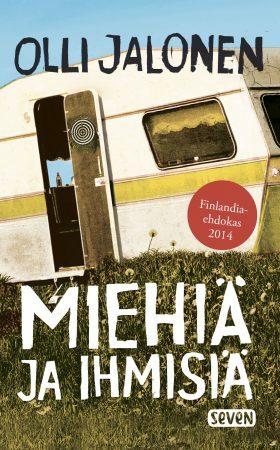 Jalonen describes youth and the atmosphere of the era with impressive perception and empathy. We have a wistfully singing treasure of reminiscing prose, a smile for youth in our hands... Jalonen is a master in how the mind wonders... Bravo! Jalonen gives hope, even forgiveness, a chance, even though composed pain also runs through the novel.